The Fastest Growing Childbirth Education Program in the U.S.! HypnoBirthing® is a “full-service” childbirth education course, teaching everything NEEDED to prepare mind and body to have a healthy birth. While HypnoBirthing is effective and easy to learn at any time during pregnancy, even late third trimester, much can be gained by taking the class early so that proper nutrition, daily relaxation practice, and preparation of your mind and body for birthing can be developed over a period of time. 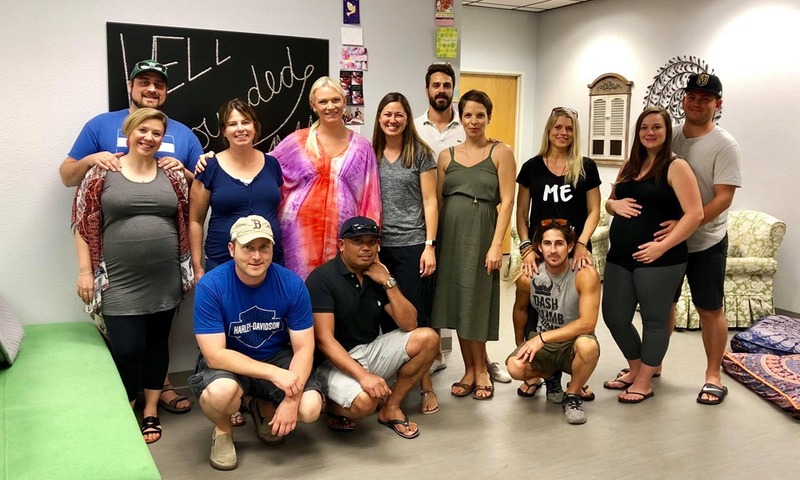 The HypnoBirthing Institute is now recommending that expectant parents begin classes early in the second trimester, so that the relaxation becomes a way of life. Most births (90-95% of all births) are without problems, at least if we refrain from intervening in the process. Therefore HypnoBirthing® doesn’t teach about complications. Why spend hours discussing things that only happen in a few births? Moms and dads often say that after they have finished their hospital childbirth course, they had the feeling that all births have complications and that they would be very lucky indeed to not have any interventions. So we don’t go there. You have hopefully chosen your childbirth/obstetric provider wisely and if an unforeseen turn happens in your birthing, you have them to guide you in your options. Most childbirth courses teach that pain in inevitable during childbirth, and suggest ways to cope and endure. HypnoBirthing® teaches that there is nothing inherently painful about birthing. Birthing muscles are like every other muscle in the body, and when they are functioning properly, they don’t hurt. It is actually fear and tension that lead to pain. All childbirth classes teach that if you will relax, it will be easier. HypnoBirthing will give you the tools to do just that. Labor will mostly likely be intense and hard work, but it doesn’t HAVE to be painful. HypnoBirthing doesn’t promise that birth will be painfree, but many women report that they did not experience pain. Many childbirth education classes teach what to expect in the hospital, how to be a “good patient” and how to help the mom have the best experience possible. HypnoBirthing® teaches parents to remember that this is also the BABY’s birth — he or she will only get one chance to be born. How would you like to welcome your baby into the world? If you keep your baby’s interests in mind, you’ll chose your birthing preferences wisely and you will have a wonderful experience too.